Raku firing is expressive, exciting, and fun. Whether you’re rakuing in your own studio, or taking part in a group firing at a school, workshop or community center, raku offers many rewards. But the process requires more than just enthusiasm; you need the proper equipment and tools to make the event successful. 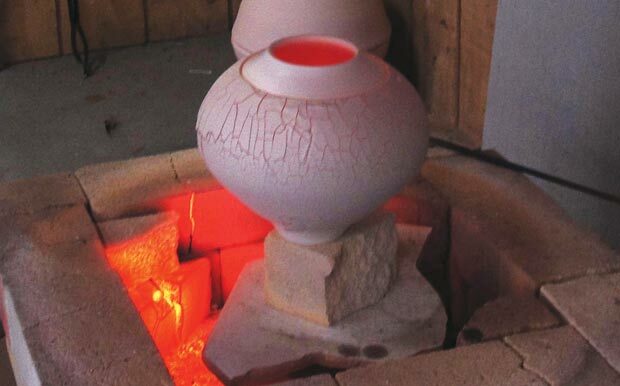 In this post, Steven Branfman shares a few pointers for getting off to a good start with the right raku kiln—the most important tool you’ll need. – Jennifer Poellot Harnetty, editor. With raku you begin by placing your work in a cold kiln and bringing it up to temperature, approximately 1800–1900ºF. The rate at which you attain this temperature is based on a variety of factors: size of the work, size and type of kiln, burner output, etc. A raku session usually consists of firing more than one load, so the ability to preheat the waiting work, unload the hot ware safely, reload, and then reheat the kiln all need to be considered. The choice of fuel—natural gas, wood, electric or propane—is important because each of these carries limitations as well as benefits. You’ll need to consider the physical location of the kiln so that it can be placed with ample space around it for safety and space to work. And finally, consider whether you’ll be firing alone, with an assistant, or with a group. There are many configurations for raku kilns—top loaders, front loaders, top hats, car kilns, and clam shells. Some top hats have pulley systems, springs, counter weights, and guiding tracks to raise and lower the chamber. Without the lifting mechanism, a large top-hat kiln requires two people to safely lift the body off, while smaller kilns require only one person. After gaining experience, most raku potters gravitate to one specific style and design. The important thing with any kiln is that you are comfortable with its workings. It must accommodate your work. 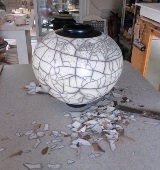 It must be possible to safely open the extremely hot kiln, remove the contents, reload, and close it up again losing as little heat as possible. Before buying or building a kiln, do as much observation, participation, and research as possible. Even though most raku firing takes place in the cone 010–04 range some of the kilns on the market are rated for higher temperatures—up to cone 10. While some kilns are designed specifically for raku, others were originally designed as stoneware kilns that can be used for raku or were modified for raku. You’ll need to check with manufacturers about the full capabilities of their kilns. Raku kilns can be fired with natural gas, wood, propane or electric. If using propane, you’ll need to purchase or rent a tank. While a 20 lb. tank works on warm days or with smaller kilns, it is recommended that you get a larger, refillable tank, or purchase two or three smaller tanks and gang them together with the appropriate connectors. You can take 30, 40, 60, 70, and even 100 pound tanks in for refilling. With propane, more surface area in the tanks means more gas will be produced assuring a steady supply. This is especially important as you get into larger kilns with bigger burners. With natural gas, you are limited to the available pressure and location of a gas line, but there is some flexibility because you can lead a gas hose to the burner. Burners are rated by their output, which is measured in Btu’s (British thermal units). Natural gas and propane use different orifice sizes so you’ll need to specify which kind of fuel you’ll be using. Kiln manufacturers have done the engineering for their kilns and have matched the appropriate burner(s) with the unit, taking size, insulation, and temperature range into consideration. Many manufacturers also offer regulators, gauges, and safety features with their burner, which are described in their literature. If you’re building your own kiln, instructions should include burner specifications. If not, consult with a burner supplier. Kiln size, construction materials and type of gas being used is all the information they will need. While any electric kiln can be used for raku, there are some electric kilns on the market specifically designed for raku. Regardless, you’ll need to either locate the kiln outside, or near an outside entrance so you can unload the kiln and quickly move your pieces outdoors for the subsequent post-firing phase. One hazard with using a standard electric kiln is that the power must be shut off before reaching into it with metal tongs to eliminate the possibility of accidentally touching a live element. Some electric kilns are built with a lifting mechanism, which raises the entire body of the kiln, including all the electrics, up and out of the way when loading and reloading. One option is to build a raku kiln from one of the many plans available in books and online. We have two plans on our website at www.potterymaking.org, one for a fiber-lined wire-frame design, and the other a small fiber-lined barrel. Another inexpensive option for the DIY route is to purchase a raku kiln kit. Some kits, which include all the materials needed to not only build a kiln, but also essential extras like tongs, furniture, gloves, etc. Raku is inherently a dangerous activity, but no more so than working around a bonfire. If you purchased a commercial kiln, you’ll need to read, understand, and follow all safety instructions provided by the manufacturer because their warnings are based on experience and following them assures an accident-free experience. If building your own, be sure that you’re comfortable and confident in your design and experience. The appropriate clothing, gloves, and eye protection are critical for protection against the kiln’s heat for any of those handling the work, and in both solo and group situations, attention must be paid to the “choreography”—the dance—of the raku firing process. It is certainly not the time to be tripping over one another. Many commercial raku kilns are priced under $1000 with a few fetching more than $2500 because of the need for higher end functionality. Building your own raku kiln from a kit or rounding up all the pieces and parts can lower your costs. It is similar to buying a computer or any other major appliance; determine what’s in your budget and then look around, but don’t forget to factor in tongs, gloves, goggles, shelves, and the other equipment you’ll need. We’ve listed most of the manufacturers and their website, and several of these sell through distributors, which may be closer to home so you’ll pay less for shipping. If you haven’t tried raku, but have always been fascinated by the spontaneity, immediacy and simplicity of the craft, by all means, sign up for a workshop. You’ll be amazed at what a great activity this is and why it’s one of the most popular clay studio techniques around, enjoyed by thousands of potters of all ages.